Gregory Ewer is well known to Portland audiences for his regular appearances with the Oregon Symphony, Portland Baroque Orchestra, Third Angle New Music Ensemble and Pink Martini. He is also the founder and artistic director of 45th Parallel, a highly acclaimed chamber music series featuring musicians of the Pacific Northwest. Gregory began his musical career at the age of seventeen with the Houston Grand Opera Orchestra. While in Houston, he studied with Fredell Lack at the Moores School of Music, and worked as a graduate assistant to Sergiu Luca at the Shepherd School of Music at Rice University. He was also the fiddler in the Houston-based bluegrass band, Classical Grass. 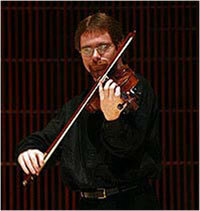 In 2001, he joined the Oregon Symphony, appearing as a soloist in 2006, and contributing regularly to the Symphony’s educational and outreach activities. Gregory has appeared recently as a guest recitalist at Yale University and at the National Library in Mexico City. He has performed at numerous summer festivals including the Tanglewood Music Center, San Luis Obispo Mozart Festival, Grand Teton Music Festival, Moab Music Festival and the Montana Baroque Festival. Recent recordings include the six string quintets of Giuseppe Antonio Capuzzi for Cinnabar Records, and a compilation of pieces by contemporary Chinese composer Chen Yi with Third Angle New Music Ensemble.